Manager Craig Levein has hailed skipper Darren Fletcher as an inspiration to the Scotland squad as the midfielder nears an international return. The 28-year-old Manchester United star is playing again following 10 months out with a chronic bowel complaint. And he is expected to be included in Levein's pool for World Cup qualifying matches against Wales and Belgium. "He can't be anything else other than inspirational for the rest of the group," said Levein. The squad for this month's crucial away double-header will be announced on Tuesday, with Scotland having started their campaign with disappointing home draws against Serbia and Macedonia. Fletcher, who won the last of his 58 Scotland caps in a friendly against Cyprus in November 2011, featured as a late substitute against Galatasaray in the Champions League last month. And he played the full 90 minutes of United's League Cup win over Newcastle. Speaking to a new online magazine venture from the Scottish FA, Levein said: "I just have huge, huge admiration for the boy, to know what he has gone through, to see his resilience, his bravery and his absolute determination to play for Scotland. "He's been on the phone over the summer and he's itching to play and get back involved. "Getting him back, for me in a selfish way, is a great thing for me and for Scotland. But the person that I'm most happy for is Darren. "He's the one who's had to grit his teeth at times and get through it and get himself back to this point where he's on the fringes of coming back into the team again." 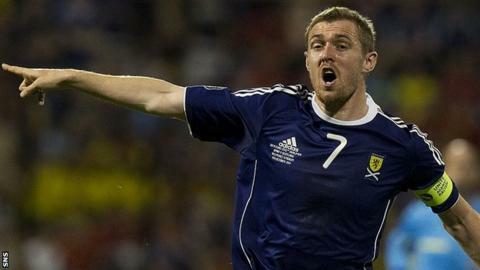 Levein added: "I certainly wondered if we'd ever get him back in a Scotland jersey. "Playing for Scotland means that much to him that he's fought his way through this illness. "He's a talisman. He has a presence about him that has a calming effect on the rest of the squad. "He's a fantastic football player - but a really good human being as well. "I want good people who are honest, hard-working, who want to do their best for their country and who turn up for every single opportunity they get to play." Levein's midfield options should be further boosted by the return of Celtic skipper Scott Brown, who missed the opening group games with a hip injury. However, Leeds forward Ross McCormack is currently sidelined with an ankle problem, while injured full-backs Steven Whittaker and Phil Bardsley have yet to play this season and Alan Hutton is not being selected at Aston Villa. The threat of a ban hangs over Everton's Steven Naismith, with Fifa investigating an off-the-ball incident in the goalless draw with Serbia. And there has been nothing to indicate that Levein will do a U-turn on his decision to overlook Steven Fletcher, despite the striker's great start to the season at Sunderland.